When dogs act aggressively toward other dogs, the canine is asking the owner to participate as a pack leader. Nearly every animal will select a pack leader because they instinctively understand who in the group can best lead the pack due to their strength and assertiveness. The dog understands that the pack leader is more concerned with keeping the pack safe over and above themselves. 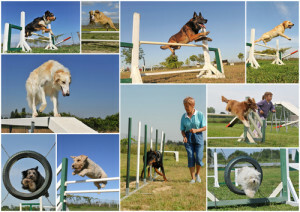 However, for the owner to become the pack leader, they must earn the dog’s loyalty, trust and respect. Owners can do this by providing the animal with boundaries, limitations and unwavering rules. Once the dog recognizes the owner as the pack leader, most of their aggression toward other dogs will stop. This is because they no longer need to fight for dominance because they recognize the owner is in charge. Powerful breed dogs tend to be highly frustrated when the position of the pack’s leader has not been established. Leadership is crucial in large breed dogs because of the canine’s sheer strength and size. Large dogs including Pit Bulls, Rottweilers, Mastiff and Cane Corso breeds can quickly become a dominant or frustrated animal when posed with a perceived serious threat. Through training, the owner can gain control of every situation and alter the dog’s behavior and attitude before the problem escalates. Any dog breed can become highly overprotective for an unlimited number of reasons. It might be that the owner or other family member is projecting submissive or fearful energy and the dog believes it is their responsibility to take control to maintain safety. The dog may become overprotective if those in charge have not done their part in training, disciplining or exercising the animal, or has not provided the best affection model in an atmosphere where the animal believes the family is the ideal source for love and food. Any dog could easily become overprotective for fear of losing its valuable commodities that could be taken away by other individuals or dogs. If the overprotectiveness is left unchecked, the dog’s unacceptable behavior could eventually cause more serious aggression that could lead to injuring humans and other animals. Without taking appropriate steps, the dog will never change their behavior. Overprotectiveness usually requires rehabilitation through socialization with other people and humans. However, the family members must also rehabilitate their own behavior by practicing and keeping calm-assertive energy when around the animal. In all likelihood, the dog’s aggressiveness is in response to the owner or handler’s energy. When the handler becomes nervous, the dog will easily behave aggressively and act out inappropriately. Once a dog recognizes the owner is the pack leader, it is essential to take the animal out on walks to help socialize their behavior while the handler maintains their own calm-assertive energy. Allowing the dog to get a workout every day will eventually cause them to become significantly more relaxed in their environment. Dog owners and dog handlers are legally responsible to take every effort possible to prevent dogs from biting or attacking humans and other animals. When dog bites occur, the owner may face both criminal and civil action where law enforcement cites or charges them with an offense and victims file lawsuits and claims for compensation. With proper training, most dogs can lose their aggressive behavior caused by territoriality, fear, frustration and overprotectiveness.